Since the death of its charismatic leader Yasser Arafat in 2004, Fatah seems gradually to have been losing its shine as a popular liberation movement. Other factions have been competing with it for the unique position it had held in the hearts of Palestinians for more than four decades. After his death, Arafat was succeeded by his old comrade Mahmoud Abbas (also known as Abu Mazen) as Fatah’s secretary general, head of the Palestinian Liberation Organization (PLO), and president of the Palestinian Authority. Since then, however, Fatah has been in dire need of qualified personnel who could help preserve its prestige and position, even though the movement had for years helped its members preserve theirs. In 2006, Fatah lost the Palestinian legislative elections in its first democratic encounter with its main ideological rival, Hamas. At the time, there was a consensus among observers that Fatah was too weak to win an election and that it lacked young, vigorous activists. The outcome of those elections, they said, reflected both public and internal discontent with the movement’s leadership. Disappointed by the results of the elections, Fatah’s leaders tried to shake things up during the movement’s Sixth Conference, in 2009: they opened the way for several activists in their 60s to occupy higher positions, calling them “young faces.” Fatah’s seniors had held on to power for decades, letting no new blood flow into its decision-making circle. Among those who had long been kept out of Fatah’s leadership circle was Mohammed Dahlan. Eventually, during the 2009 conference, Dahlan was elected to the membership of Fatah’s Central Committee, but he continued to lash out at the movement’s older generation, including Abu Mazen. In 2003, Dahlan had criticized Yasser Arafat himself, who was, and still is, seen by most Palestinians as the icon of Palestinian patriotism. 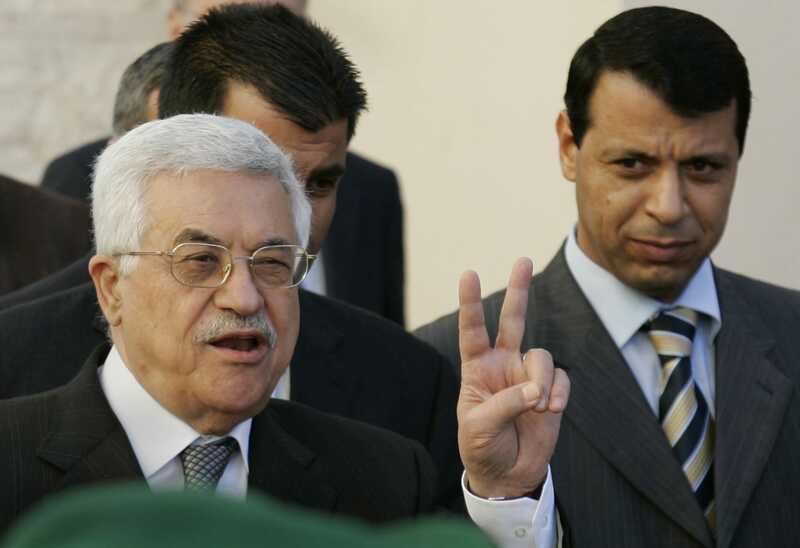 Dahlan had always wanted to take Abu Mazen’s position, an intent that Abu Mazen could not fail to notice. Soon after the conference, Abu Mazen (born 1935) ordered Dahlan to be removed completely from Fatah. Dahlan was also tried in absentia for libel and was convicted and sentenced in 2014 to two years of imprisonment; late last year, the Palestinian Authority opened an investigation into allegations of corruption against Dahlan. Expelling Dahlan and several of his supporters reflected the discontent among Fatah’s younger generation, which refused to be marginalized by its leadership. In fact, Dahlan represents a current in the higher levels of Fatah’s structure: several younger leaders who have been awaiting a chance to oust the older leaders. This current is still popular, especially in Gaza. Fatah’s Seventh Conference was scheduled for the end of January 2015 but was postponed indefinitely, due to major differences among members. It is hoped that this conference, when it is held, will bring some younger blood into the movement and show the world what the post-Abbas Fatah will look like. Discussions are now underway concerning who would fill four main positions in the post-Abbas era: head of the Executive Committee, head of the Palestinian Authority, head of the Legislative Council, and head of the Palestinian National Council (currently Saleem al-Zaanoun, aged 82). Apart from Dahlan and the group he represents, there is a group of Fatah members now known among Palestinians as Fatah’s “pivotal” or “key” figures, due to their great influence on Fatah’s internal decision-making. These members are now to be found throughout Fatah, in the Central Committee, the Revolutionary Council, the Advisory Council, and the leaderships of regional divisions in both the West Bank and Gaza. Among them are Tawfiq al-Tirawi, Jibreel al-Rajoub, Muhammad Eshtieh, Mahmoud al-Aloul, Jamal Mheisin, Hussein al-Sheikh, and Azzam al-Ahmad (the influence of the latter has been weakened since a TV interview in which he criticized Abbas). Marwan al-Barghouti is imprisoned in Israel and thus absent in body but present in spirit. Barghouti, who has been detained by the Israeli authorities since 2002, is still able to mobilize huge numbers, especially among the Fatah grass roots. In recent meetings of Fatah’s Central Committee, Abu Mazen insisted that only 1000 members would attend the movement’s Seventh Conference: about 200 representing members of the Central Committee, the Revolutionary Council, and the Advisory Council; 100 representing regional offices; about 400 representing regional offices of the West Bank; and about 300 representing the regional offices of Gaza. Fatah’s “key” figures are now in competition for the support of the conference participants. It will be more difficult, however, to secure the support of the winners of the Gaza primaries. Surveys show that the majority of Gaza candidates support Dahlan, who managed to maintain his popularity there by providing financial support to Fatah members from Gaza, at a time when they were neglected by Fatah’s leadership in the West Bank. Fatah’s regional offices in Gaza, like everywhere else, are supposed to elect their representatives for the Seventh Conference, but leading figures of Fatah in the West Bank have put the whole process on hold after only two offices of seven had held their meetings and had come up with names that did not please the leadership, although the latter had allowed those two meetings only after it made sure Dahlan’s men were going to lose. Experts on Fatah’s affairs believe that the movement is currently in progressive decline. Personal interests have become much more important than loyalty to the organization and its future. This begs the question: What will happen when Mahmoud Abbas dies? The three or four main currents within Fatah in 2015 would probably fall quickly into infighting over Abbas’ political inheritance and the positions he holds. Defections and splits would become inevitable, which, in turn, would leave Hamas the strongest actor on the Palestinian stage.